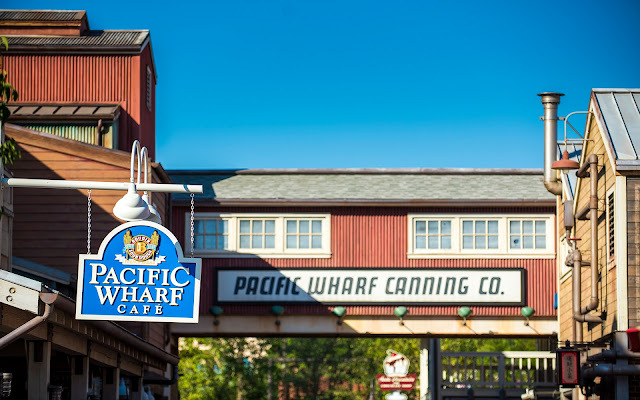 I like this viewpoint from within Pacific Wharf because it reminds me of a mixture between the San Francisco docks and the Monterey area, both with rich seaside environments. There's a combination of a romantic and industrial spirit here, reminiscent of the hard work that brought this part of Northern California to success. And then, there's also the fact that being here means I'm just steps away from a delicious clam chowder bread bowl from the Pacific Wharf Cafe, or a sweet treat from the Ghirardelli Soda Fountain and Chocolate Shop! The Pacific Wharf Cafe sign hangs in front of the Pacific Wharf Canning Company.